Who doesn’t like mummies, especially when the deceased is King Tut? Add in Howard Carter, the amateur archaeologist who in 1922 found the boy pharaoh’s tomb still intact in the Valley of the Kings; Lord Carnarvon, who financed years of excavation and whose ancestral Highclere Castle today serves as the setting for Downton Abbey; Carnarvon’s daughter, Lady Evelyn, who may or not have been romantically entwined with Carter; plus more historical characters and locales, and what you get is the rollicking read that is Sally Beauman’s The Visitors. There is much to delight in this book. So beguilingly does Beauman weave fact and fiction that after 525 pages the reader still wants more pages to turn. Characters are well drawn. There is a believable sense of place, time, politics, social context, even period clothing. We feel the beauty of the desert, its blinding light, its insufferable heat while protagonists wear three-piece tweed suits. The story unfolds from the point of view of fictional Lucy Payne, a 90-year-old woman looking back. As a sickly 11 year old she is sent with her guardian, Miss Myrtle Mackenzie, to Egypt in order to recuperate from the typhoid fever that dispatched her mother. There she meets Frances Winlock, the real life daughter of American archeologist Herbert Winlock who worked on the Tutankhamun dig. 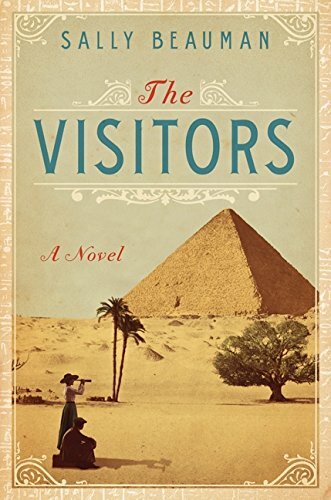 Their instant friendship propels her into the elite colonial circle that centers on Lord Carnarvon, who holds the excavation permit for the Valley of the Kings. Beauman also thrusts us into rivalries between English and American factions, between the powerful directors of the Metropolitan Museum in New York and the Egyptian Museum in Cairo, and between assorted lovers, antagonists, and social climbers. The ruckus is sublime. Long historical fiction allows the interweaving of myriad characters and subplots too numerous to catalogue here. Nearly a century after King Tut’s discovery, Beauman manages to make both the lives of her fictional characters and those at the historical center of Tut’s unearthing riveting. She credibly embeds the children Lucy and Frances in the adult entourage. She shows us events through their eyes. They glimpse Carter’s temper, his unexpected acts of kindness, Carnarvon’s benevolence, and above all archaeological details from an event of the last century. Lucy and Frances are eyewitnesses to history, but also to a secret hidden for decades: that Lord Carnarvon broke into the tomb before the official opening and illicitly removed artifacts for his personal “pocket collection.” The book ends with a clarifying appendix of actual people and places, but it may help readers to consult this first before diving into the meat of the text.